The late Mr Lang Hancock commenced blue asbestos surface mining at Yampire Gorge in 1937 by using mainly indigenous Banjima people. The blue asbestos fibres were manually bagged and taken to Roebourne to be loaded onto ships for the United Kingdom market. With the onset of the Second World War in 1939, the asbestos market opportunity arose with the demand for larger quantities of blue asbestos fibres. In 1943 Mr Hancock sold the majority share to CSR Limited (ABA became a subsidiary of the parent company CSR). Mr Hancock remained the manager of the mining and milling of the asbestos until 1948 and CSR appeared to be unhappy because the operations of the milling were so filthy and CSR took over management of the mine and mill. In 1946 the Yampire Gorge mine was closed and Wittenoom Gorge mine was opened. The mine consisted of a number of stopes (tunnels) and a milling operation (crushing the host rock to extract asbestos fibre). The miners had to crawl in the hot dark stopes bent almost double, as many stopes were not more than a metre high, and choking with dust. Working conditions in the mill were even worse than the mine. The ore from the mine was taken to the mill by an open conveyor belt to be ground down and fibre extracted. The men worked in clouds of dust for hours on end needing floodlights to see even at midday. Since we know now there is no minimum safe level of exposure to asbestos, a minute in such concentration is enough to cause lung cancer or mesothelioma. The Asbestos Diseases Society is led to believe that CSR knew that asbestosis and lung cancer were the extremely likely result of working in conditions such as those it permitted in Wittenoom. Their knowledge was established in the Victorian and Western Australian courts through the judgments of asbestos-caused injury litigation. By 1988 a Supreme Court jury found that CSR had been “recklessly indifferent” to the safety of its workers and that ABA knowingly allowed the processing of asbestos to continue even though the dangers of asbestos fibre inhalation were known as early as 1926. For the duration of the mining operation until the closure of the mine on 31 December 1966 there were more than 20,000 persons living in Wittenoom including more than 4,000 children being born in Wittenoom or arriving with their parents. In addition there were many visitors regularly arriving to walk through the gorges and indeed inhale quite a bit of asbestos dust. To our understanding there were a number of indigenous people who did not count at all and were even excluded from the census. We are led to believe conservatively that more than 4,000 people who lived and worked at Wittenoom, including a number of wives and children including a host of indigenous people have died of asbestos diseases. It is predicted that more than 60,000 men, women and children will die in Australia by 2035 from work at Wittenoom and James Hardies or passive exposure to asbestos, i.e. domestic renovation or demolition. Regrettably it is very likely the numbers of asbestos diseases casualties will be larger than the number of Australian diggers killed during World War One. 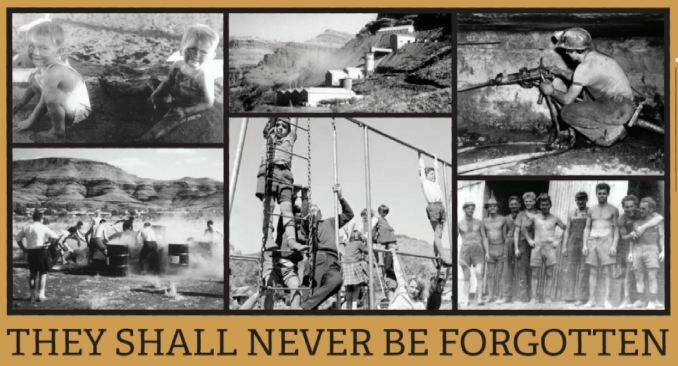 Several months ago former Wittenoom residents who have had substantial losses of their loved ones through exposure at Wittenoom discussed creating a plaque of remembrance of the brave men, women and children who have lost their lives. 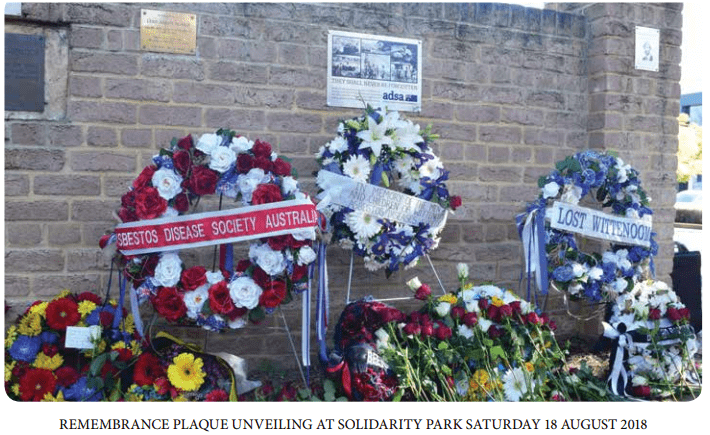 The plaque of remembrance was unveiled at Solidarity Park on 18 August 2018 with the support of Unions WA.